Jonathan Toker is the Slowtwitch.com science editor and an elite-level trail runner-triathlete who hails from Canada and lives in Southern California. He received a Ph.D. in organic chemistry from The Scripps Research Institute in 2001. Jonathan invented the SaltStick products in 2002, and has been found to have high levels of electrolytes in his blood. Visit www.SaltStick.com for more information. 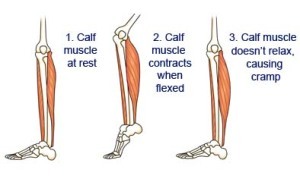 With several high profile World Championship events and long distance races still on the calendar, this is a great chance for a reminder on dealing with muscle cramping. Cramps are particularly prevalent in hot conditions but it is good to understand the causes and solutions for year-’round activities of all levels and pursuits. Muscle cramping can be caused by several factors. However, at a base level, the understood cause of cramping is the brain signaling muscles with increasing urgency to fire at a time when the muscles are becoming fatigued or the signals are not being transmitted efficiently. When the muscle becomes too fatigued to contract, or the signal is not being successfully converted to a command, the body compensates by sending more signals to get the muscle to behave as desired. At some point, the signals overwhelm the muscle and initiate a cramp. Many cramps are caused by muscle fatigue due to inadequate training (think of running a marathon on 10K training) or an unusual amount of muscle use (think of using fins for a hard kick set in the pool with no prior experience). Another major cause of cramping is electrolyte imbalance due to loss of electrolytes in sweat. These charged ions of sodium, potassium, calcium, magnesium, and chloride are responsible for muscle behaviour after the signal is sent for muscle contraction and relaxation. Variation of the concentration of these electrolytes in plasma (blood) and within cells can be caused by loss of electrolytes and fluid in sweat, and by replacement of electrolytes and fluid by consumption. Sweat contains principally water and electrolytes. As electrolyte content of plasma decreases due to sweat loss, replacement of the water component alone will cause electrolyte levels in plasma to drop. Neglect rehydrating with fluid, and you risk serious dehydration. It’s a delicate balance within a fairly narrow range to rehydrate correctly, and the necessary replacement of electrolytes lost. If plasma electrolyte levels fall outside the optimal range, the body will begin to compensate as much as possible to maintain normal levels. As a simple level, this is accomplished primarily by controlling plasma volume though the displacement of water. For example, if plasma levels of electrolytes are low due to overhydration, the body will avoid further plasma dilution resulting in “water baby” or a gut full of unabsorbed water. The most effective solution for this common problem is to take on additional electrolytes in the concentrated form of a capsule with minimal fluid. On the other hand, if neither fluid nor electrolytes are replaced and sweat loses continue to grow, the plasma electrolyte levels will begin soar. In this case, the body will begin to retain as much fluid as possible resulting in swollen fingers and no urine production. Drinking fresh water, and depending on the circumstances, consuming electrolytes, may resolve this issue. Proper electrolyte supplementation prior to, and throughout your event, along with appropriate fluid intake, is key to avoiding cramps and performing your best. A balanced supply of absorbable sodium, potassium, calcium, and magnesium is your best weapon against cramping. With those electrolytes lost in a 220-63-16-8 ratio for the average athlete, it is in the athlete’s best interest to ensure that replacement of the full spectrum of electrolytes is replaced, and in a form and quantity the body can absorb. Ensuring an ongoing and optimal balance of electrolytes and hydration will enable you to focus on the task at hand and race your best without pesky cramps from ruining your day. A case study with numerical examples are provided through this link. A useful comparison chart is available Here. Solid post! And helpful since I’m in the South. Does he recommend a certain mg number of salt intake per hour? Check out the links above for information on amount of salt/hour. Much of it will depend on how much you sweat and how hot the conditions. Practice in training to fine tune your regimen. I find how you explained electrolyte deficiency to be very informative. To make things simpler, some of the recommended foods that we can take to replace lost electrolytes are salted dishes, meat, dairy products, and a variety of fruits and vegetables. But the best thing that we can do is to have a balanced diet for us to stay fit and healthy. Next story Can’t we all just get along? Some thoughts on sharing the road.